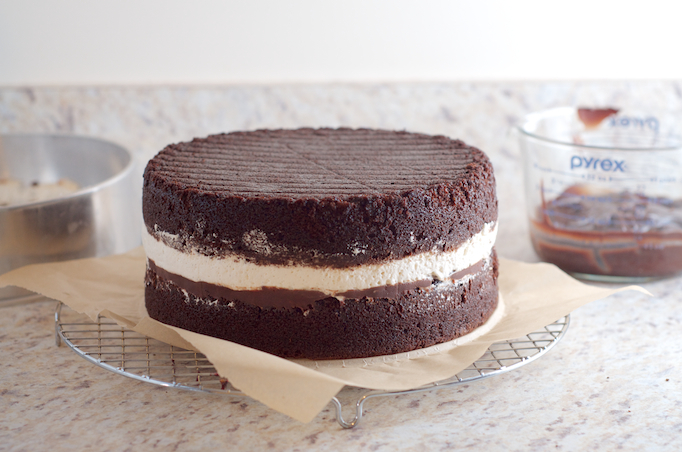 My springform pan, which is 2.75″ tall, was just high enough to capture the second layer of the cake without having any of the whipped cream layer exposed. I also lined the bottom of my springform pan with parchment, so I could easily slide the bottom disk of the springform pan from the cake before the final covering with the ganache. I hate cutting off the metal base, and I think it takes away from the presentation. Pre-heat oven to 350°F. Coat cake pans with nonstick spray. 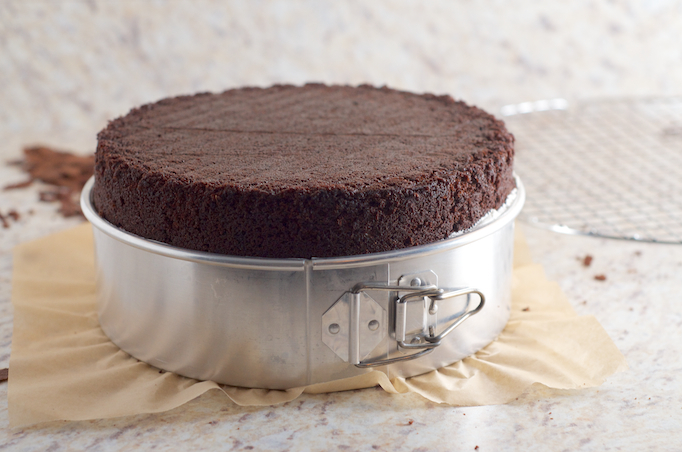 Be sure the pans are 2″ high; the cake bakes up all the way to the top. Line bottom of pans with parchment-paper rounds; coat paper. 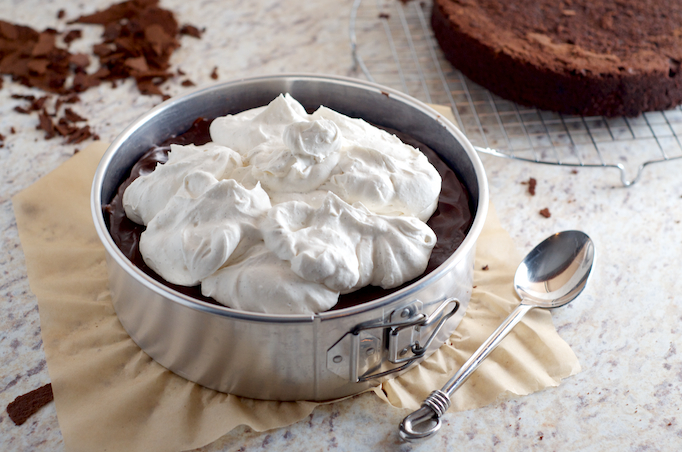 Place cocoa powder and chocolate in a medium metal bowl. Pour hot coffee over. Let stand for 1 minute. Stir until smooth. Stir in buttermilk and vanilla; set aside. Whisk cake flour and next 3 ingredients in a medium bowl. Using an electric mixer, beat sugar and butter in a large bowl until light and fluffy, about 4 minutes. Add eggs one at a time, beating to blend between additions and occasionally scraping down sides and bottom of bowl. Beat until light and fluffy, about 4 minutes. Add dry ingredients in 3 additions, alternating with chocolate mixture in 2 additions, beginning and ending with dry ingredients. Divide batter evenly between pans; I like to use a baking scale to make sure the batter is divided evenly. Smooth tops of cakes. Bake cakes until a tester inserted into the centers comes out clean, about 35 minutes. Transfer to wire racks; let cakes cool in pans for 10 minutes (cakes will deflate slightly). Run a knife around pans to loosen cakes; invert cakes onto racks. Peel off paper and let cakes cool completely. Turn cakes over. If needed, use a long serrated knife to cut off bumps or trim dome from top of each cake to create a flat, even surface. Place chocolate and salt in a medium bowl. Stir sugar and 1/4 cup water in a medium deep saucepan over medium-low heat until sugar dissolves. Increase heat and cook without stirring, occasionally swirling pan and brushing down sides with a wet pastry brush, until sugar is deep amber, about 9 minutes. Remove from heat and gradually add cream (mixture will bubble vigorously). Return to heat and stir over medium heat until caramel bits dissolve. Pour over chocolate in bowl. Add vanilla; stir until mixture is smooth. Let cool slightly. It took a while for my ganache to cool, so to speed up the process I separated 1 cup of the ganache out for the center of the cake, and let it cool in a small shallow bowl. Loosely line springform pan with a square of parchment or wax paper; carefully place ring over paper and tighten. Place 1 cake layer in springform pan. Pour 1 cup ganache over. Chill until set, about 30 minutes. 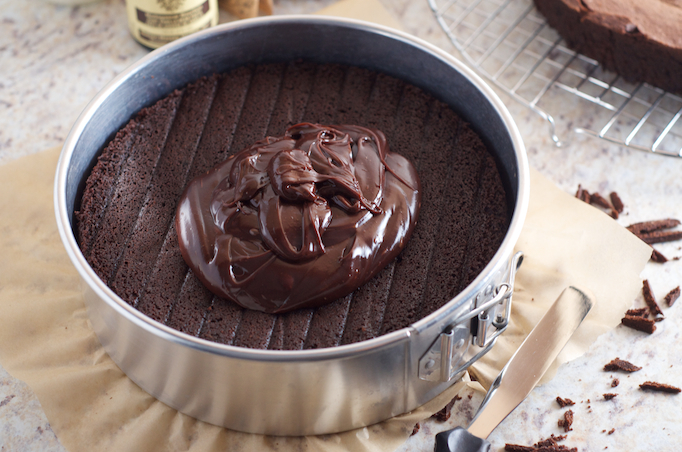 Cover remaining ganache and let stand at room temperature. Place 2 tablespoons cold water in a small heatproof glass or metal bowl. Sprinkle gelatin over; let stand until gelatin softens, about 10 minutes. Pour water to a depth of 1/2″ into a small skillet set over medium heat. Transfer bowl with gelatin to skillet; stir until gelatin dissolves, about 2 minutes. Remove bowl from skillet. Set aside. Place cream and powdered sugar in a large bowl. Scrape in seeds from vanilla bean. Using an electric mixer, beat cream until soft peaks form. Add gelatin; beat filling until firm peaks form. Spoon filling over chilled ganache on cake layer in pan; smooth top. Gently place second cake layer on top. Cover tightly with plastic wrap and chill until cream layer is set, at least 6 hours or overnight. Remove sides from springform pan. 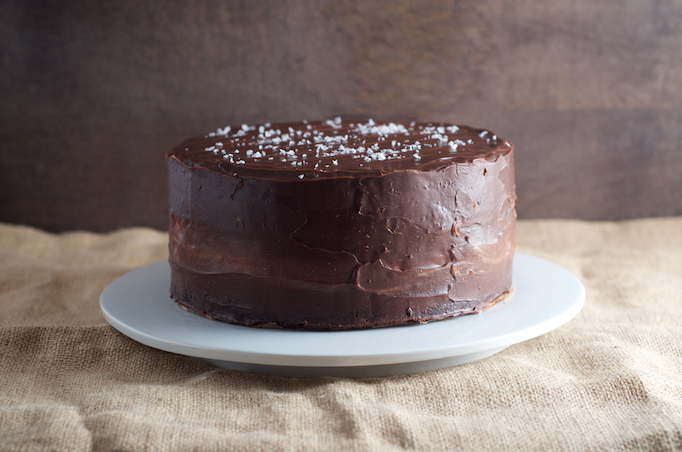 Using a knife or offset spatula, scrape off any filling that may have leaked out from between cakes to form smooth sides. Transfer cake to a wire rack set inside a rimmed baking sheet. If using parchment paper like I did, slide cake off of pan base and onto wire rack. Trim away excess paper at this time, leaving only a small tab, about 2″ wide, to help pull the cake onto a cake plate after glazing. Rewarm remaining ganache until just pourable. (Microwave in a microwave-safe bowl, or set a metal bowl over a large saucepan of simmering water until just warm, not hot.) Pour ganache over cake, tilting cake as needed to allow ganache to drip down sides and using an offset spatula to help spread ganache, if needed, to cover sides of cake. I wish I had heated my ganache just a little more than I did; it set up quite quickly on the cold cake, and I had to do more spreading than I would have liked. Chill until ganache is set, about 1 hour. Cover with a cake dome; chill. Cake can be made 2 days ahead. Let stand at room temperature for 1 hour before serving. 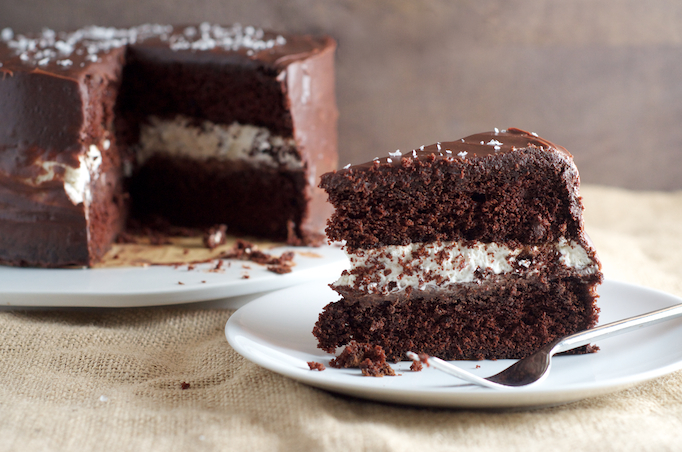 Sprinkle cake with flaky sea salt. That is one beautiful cake. Love the Ding Dong inspiration! This looks beautiful! say you wouldn’t want to use coffee, what would you suggest as a replacement? Thanks! Hi Annarosa! The coffee doesn’t come through strong, but you can always swap hot water for the coffee, if you don’t want to use it.